New Delhi : A wave of joy swept the central Hall of Parliament as President Pranab Mukherjee and Prime Minister Narendra Modi pressed a button at the midnight function to roll out Goods and Services Tax (GST). Members present in the Central Hall of Parliament, including those from some opposition parties, lauded the roll out with the thumping of desks. Later as they came out, NDA members shook hands and greeted each other over the roll out of the country's biggest indirect tax reform since independence. Petroleum Minister Dharmendra Pradhan said that there was jubilation among those present. "It is a historic day. The enactment was passed unanimously. The GST is supported by every body." He said many of those involved in the process of shaping GST were present in the Central Hall. 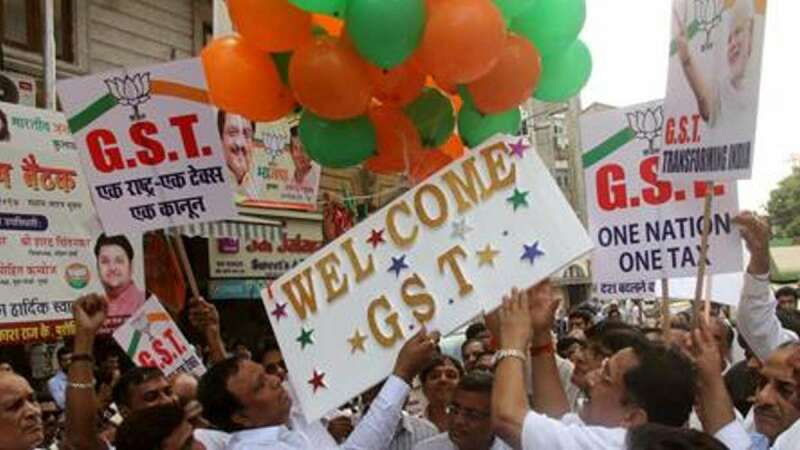 Biju Janata Dal MP Bhartruhari Mahtab said that GST is going to revolutionise the whole system. "All decisions were taken unanimously." He also said that parties such as Congress, which had not taken part in the event, "had opposed it for the sake of Opposition". The function started with President arriving in the Central Hall in the traditional procession along with Prime Minister Narendra Modi, Vice President Hamid Ansari and Speaker Sumitra Mahajan. The visiting gallaries were full of visitors. Soon after arriving in the Central Hall, Modi gestured to former Prime Minister H.D. Deve Gowda to join the leaders on the dias. The speeches by Finance Minsiter Arun Jaitley, Modi and the President were received with rapturous applause by members present. Jaitley, who did not speak to the media after the event, had an evident sense of relief and joy. Samajwadi Party's Ram Gopal Yadav briefly went out of the Central Hall, apparently as he was felt uneasy, and later returned. Among those present, were Nationalist Congress Party leader Sharad Pawar, former Samajwadi Party leader Amar Singh and actor-turned-politician Hema Malini. Senior BJP leader L.K. Advani and party chief Amit Shah were seated in the front row. Former Finance Minister of Bengal Aseem Dasgupta and former Finance Minister of Kerala K.M. Mani, who had played a role in GST negotiations, were also present. Amon those present were -- Industrialist Ratan Tata and several senior government officials who have played a role in the GST roll out. Vijay Kelkar, who had mooted the concept of GST in 2003, was also present. Leaders and MPs chatted outside the Parliament for several minutes after the function ended as they soaked in the atmosphere of in the brightly-lit Parliament precincts.